I went back to Vancouver for vacation, and during that time I had little family trip to Washington State. 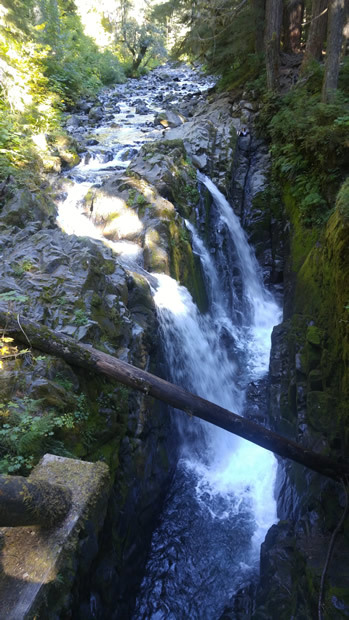 We visited Seattle, Olympic National Park and North Cascades National Park. My family has traveled up and down the west coast a few times, but it’s been a while since we’ve visited Seattle, and we haven’t been to these two national parks. Our first stop is Seattle, the biggest city in Washington State. 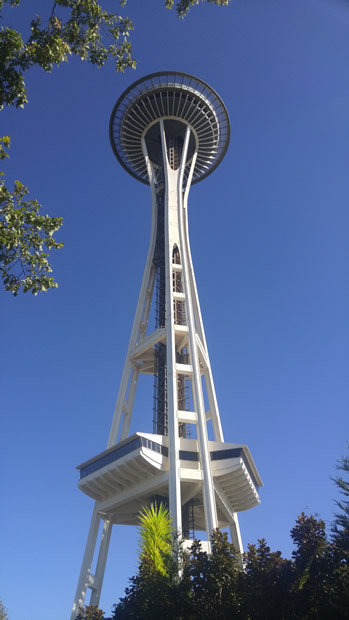 Even though I’ve been to Seattle before, I’ve never been to the local landmark the Space Needle, so that was our first stop. 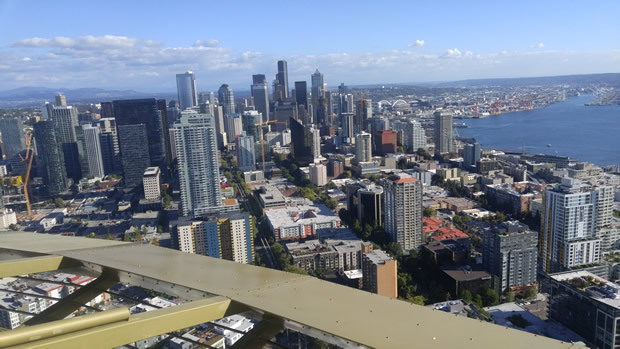 Completed in 1962, the Space Needle observation tower has been a iconic fixture of the Seattle skyline, and from the observatory one can get a 360 degree view of Seattle and surrounding area. 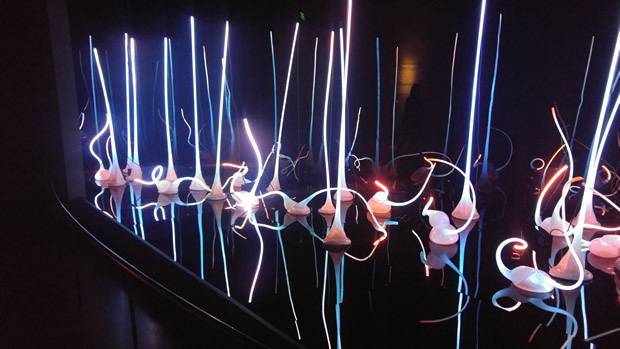 One of the beautiful glass displays at Chihuly Garden and Glass. A larger and even more colorful glass installation. The Space Needle is built in the Seattle Center complex just north of downtown that also contains some museums, theaters and other community attractions. right next to the Space Needle is the Chihuly Garden and Glass, which is a museum/exhibition showcasing the studio glass of Dale Chihuly, a famous glass sculptor. 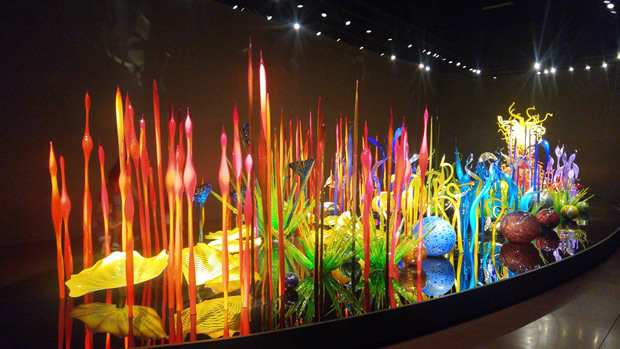 The museum is not big, but the glass works by Chihuly are gorgeous with their flowing shapes and bright colors. Some of the pieces are quite large and very impressive looking. Definitely worth the stop, especially for those going to the Space Needle. The famous Pike Place Market… but no fishes were being tossed unfortunately. Stumbled into this little gem. After Seattle Center, we strolled into Seattle’s downtown area. 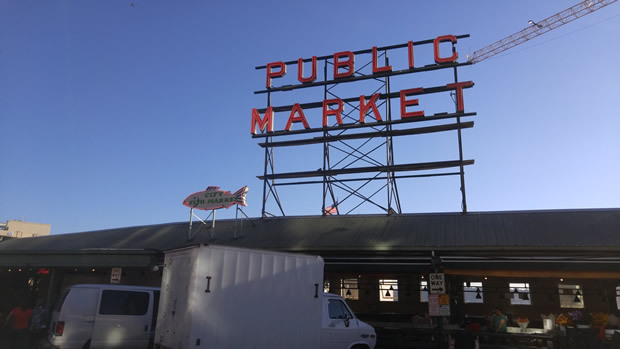 We went to the famous Pike Place Market hoping to see some fish tossing, but unfortunately got there too late and most of the shops, including the fish market, were closing down. 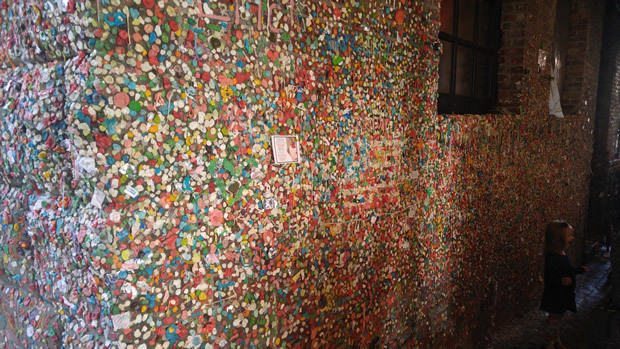 We did by chance find the (in)famous Gum Wall near the market. We also walked around the rest of downtown before departing. Overall, Seattle downtown was pretty nice. It’s got the lovely views of the Puget Sound, and it’s clean and reasonably lively. Still, I still think Vancouver is a little better . Sweeping views of the Olympic Mountains up on Hurricane Ridge (click to enlarge). The next day, we headed into Olympic National Park, which is located on the Olympic Peninsula, west of Puget Sound. It’s a big national park that contains a variety of different landscapes, from majestic mountains, to fertile rain forests, all the way to the Washington coast. We only had a day and couldn’t visit all of the facilities, but we got a bit of everything. First up, we drove up into the Olympic Mountains to take in the sweeping views up at Hurricane Ridge. To the south is the view of the Olympic Mountains, and from the location one can also see across the Strait of Juan de Fuca all the way to Victoria, BC. Lake Crescent and its clear blue waters. 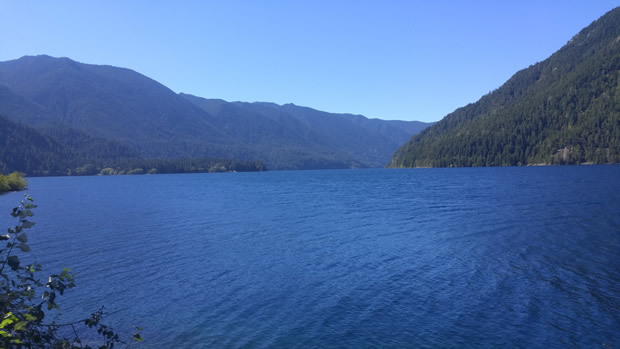 Our next stop was Lake Crescent, which is a pretty big lake with clear blue waters. We have lunch at the lodge there. The food was so-so and a bit pricey given its location, but the views of the lake was very scenic. We then stopped and hiked at the Sol Duc Valley and took a short hike in the coastal rain forest. There is a hot spring there, but we didn’t have time to take a dip. 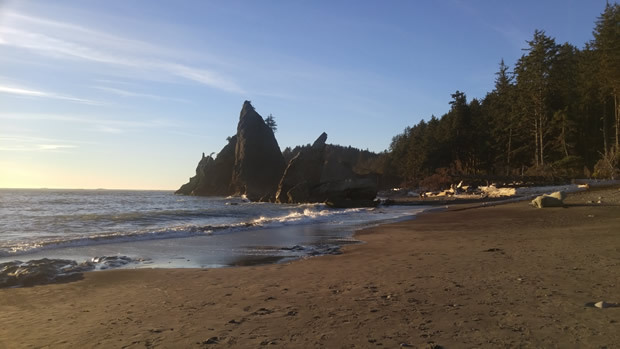 Our last stop in Olympic National Park is on the coast at Rialto Beach. The beach itself has a lot of pale tree trunks, which is in contrast to the dark sand on the beach. In the waters is also some interesting rock formations. 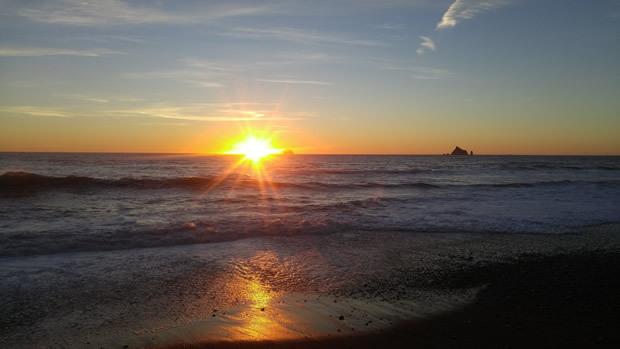 It’s been a while since I’ve had a view of the Pacific Ocean, and we saw the sunset there which was a memorable experience. Later after the beach visit, I found out that the nearest town to Rialto Beach, Forks WA, is actually the setting of the popular Twilight series. I am not really a fan of Twilight, but it is an interesting tidbit. Rialto Beach has some interesting rock formations. Pretty good view of the sun disappearing into the Pacific Ocean. The next morning, we drove to Kingston WA to ride the ferry back to the east side of Puget Sound. 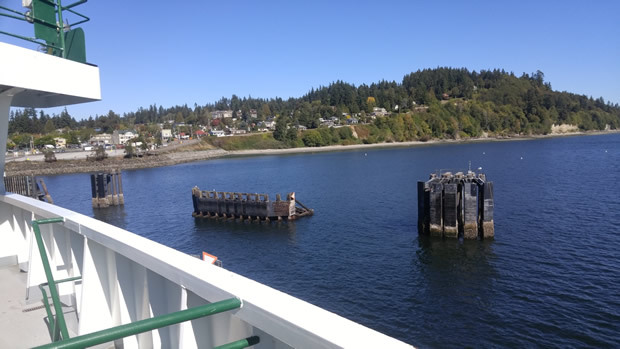 The Washington State ferries that serve the Kingston-Edmond line are large vehicle ferries which look similar to the BC ferries I’ve ridden before. The ferry ride was relatively short, but it provided some nice views of Seattle from a distance. Departing Kingston WA on the ferry. The last destination of this family road trip before we headed home was to North Cascades National Park. Located about an hour to an hour drive east of Burlington WA, North Cascades National Park protects a significant portion of the Cascades Mountains. Most of the facilities are located along Route 20 which is the main road through the park, and along this road there are various viewpoints, giving us a chance to look at the majestic mountains and pretty lakes. There is even some hydro power facilities belonging to Seattle City Light located in or near the park. That’s all I have for this post. It’s not easy to travel out of NC these days due to lack of vacation and work commitments, and I wish I had more time to spend back in Vancouver. I did eat plenty of yummy Chinese food during my short time back though . In any case, I’ll make the most of my free time to do fun stuff and make some good memories.